Raising cacti and other succulents from seed: It's easier than you think ! Many species of cacti and other succulent plants are relatively easy to raise from seed providing that a few simple rules are followed. Seeds of an unprecedented range of species of cacti and other succulent plants are available from both specialist society seed lists and commercial seed suppliers, so that with a little patience, a large collection of succulent plants can be raised from seed and flowered within a few years. Seed may also be available from your own plants, and is freely produced by some species e.g. 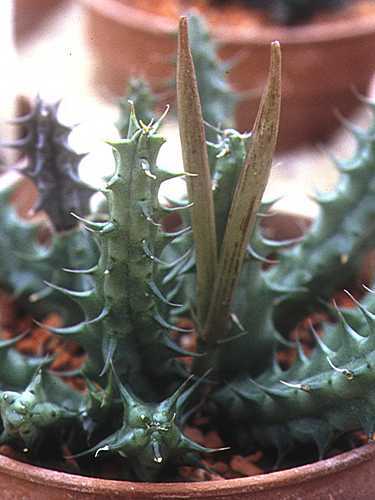 Rebutias (below right). It is well worth attempting to grow seed from your own plants and this fresh seed may germinate more readily than seed from other sources. Seeds from different species survive for different lengths of time before losing viablity. 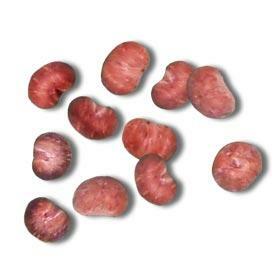 Lithops seed can survive dry for many years while seed from many Asclepiads is best sown fairly fresh. However, it should be remembered that hybrid seed may be produced by cross-pollination of different species within a genus if they are in flower at the same time. Indeed many plants are self-sterile, and if only a single plant (or clone) is available, seed production may only be possible by cross pollination by another species. Unless special precautions are taken, seed form a particular plant can only be guaranteed to be 'pure' if no other plants from the same (or a related) genus were in flower at the same time. Special precautions to prevent hybridisation could include covering flowering plants with fine netting to exclude pollinating insects and hand pollinating flowers with a fine camel-hair paintbrush. Some growers actively encourage inter-specific hybridisation by artificial pollination and some attractive hybrids have been produced from a range of plant families including Rebutia (right), Crassula, Echinopsis, Euphorbia and Conophytum. This is perfectly acceptable, as long as hybrids are labelled as such. Seed is best sown in small individual containers, although large quantities can be sown in seed trays. Seed trays can be divided into sections as required, with thin wood or plastic strips such as seed labels. If several species are to be sown in strips in one container, it is best to choose species that can be readily distinguished from each other, as occasional seeds tend to bounce from one area into another during sowing. Many growers prefer a soil-less compost, with the addition of about one part in three of sharp sand to improve drainage and texture. Partial sterilisation of the soil is useful and may be achieved by either baking in a conventional oven for a few hours, or by treatment for a few minutes in a microwave oven. Following such treatment, the compost will not be clinically sterile but will be free of insect pests and their larvae and will have a reduced burden of fungi and other micro-organisms. 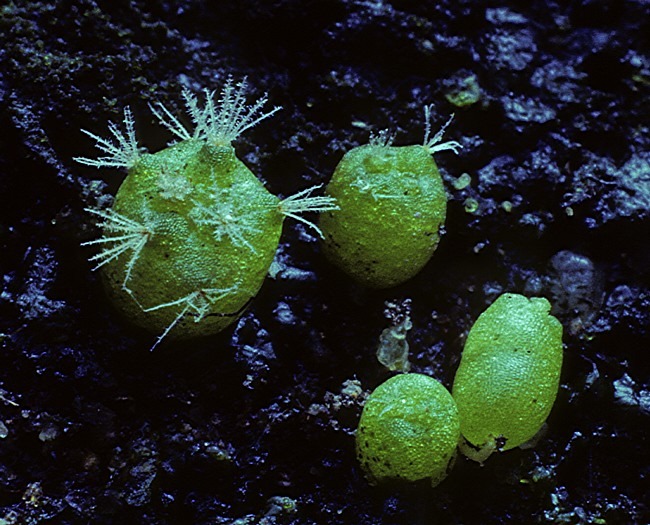 Complete sterilisation is undesirable, as the first infecting fungal spore landing on the compost produces a white bloom of fungal hyphae over the surface a few days later, and subsequent damping off of the young seedlings. Prior to sowing, the compost should be moistened by standing the container in water, or by spraying a mist of water onto the surface. Adding a fungicide (e.g. Benlate, Nimrod T) to the water can be helpful in combating 'damping off' of seedlings of some species. Seeds should be cleaned of unnecessary debris and the silk 'parachutes' of some seeds (e.g. Asclepiads) removed. Unnecessary plant material is always a potential focus of fungal infection and may promote 'damping off'. Most small seeds can be distributed over the surface of the compost, and may be covered with a very light dusting of sand. Although this is not strictly necessary, it can help to suppress growth of algae and moss. The emerging seedling roots will generally anchor themselves into the compost. Any roots that emerge at an awkward angle, pushing the seedling away from the compost can be covered with a sprinkle of sand. Euphorbias such as E. obesa have explosively dehiscent seed capsules which propel the seeds for a considerable distance from the plant. As the fruit ripens, it loses its milky sap and the capsule changes colour from green to brown. Brown capsules should be picked immediately or the seed will be lost. Various strategies can be used to retain seed from a capsule ripened on the plant. The capsule can be encased in a small paper bag or stocking net. Some growers carefully put a little water-based glue on top of the capsule to prevent its opening. Note that Euphorbia obesa and other species hybridise freely if flowers are open at the same time, so any seeds may not be genetically 'pure'. Following sowing, the seed should be kept in a moist environment in a propagator, or the whole container wrapped in a clean plastic bag. Following germination, alternative strategies used by different growers are to remove the covers after e.g. 1 month to allow the circulation of air or to leave the seeds sealed up in their containers for up to a year. Whichever method is followed, it generally advisable to avoid the compost drying out for about the first year, and watering with fungicide may help survival of delicate species. Seeds may continue to germinate over a long period of time and it should not be assumed that the first seedlings are all that will be obtained. Minimum temperatures of 60 - 70°F are usually desirable and will allow germination of the majority of succulent plant seeds, but some tropical species may require warmer conditions. Germination is not usually inhibited by light, and may be essential for some species, but bright sunlight should be avoided as the delicate seedlings may be scorched. As the seedlings grow, the amount of light given can be gradually increased, but beware of direct sunlight. 1. Sow seeds in January and cover with fine grit or sand. Water so the compost is moist and place outside where a range of natural freeze-thaw temperature cycles will be experienced. 2. Sow seeds, cover and place the container in the refrigerator for several weeks. 3. Sow seeds, cover and place the container alternately in the refrigerator and ice compartment of the refrigerator over several weeks to simulate freeze-thaw cycles. Seeds of other species are activated by chemicals found in the smoke from bush-fires and kits are available containing synthetic concoctions of these substances. Seedlings from different species of succulent plants grow at very different rates, and the grower should judge when they are ready to be transplanted. Some species (e.g. some Rebutias) can be transplanted into individual pots after a year and will flower in two to three years, while very slow species (e.g. 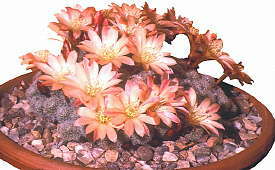 Ariocarpus) can be left in their original containers for some years. Lithops seedlings should be about the size of a pea after growing steadily for one year without withholding water, and may then be transplanted. From their second winter, they should be grown in the same way as mature plants. Seedlings are usually more vulnerable to drying out and tolerate plentiful moisture better than mature plants. 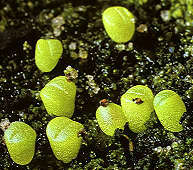 However, continuously moist conditions can encourage algae, mosses and ferns to develop. 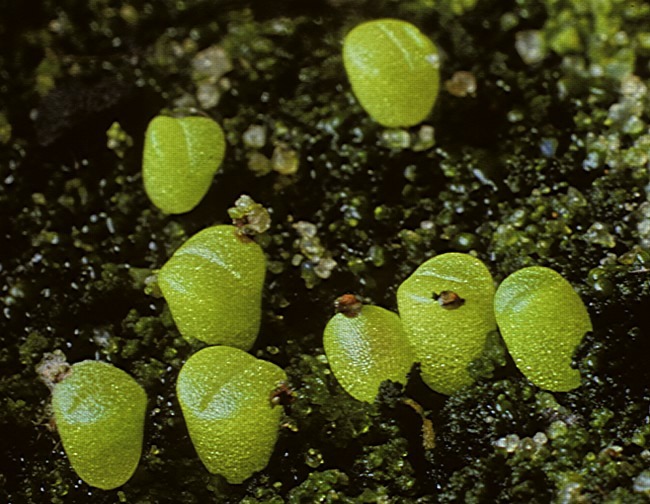 Algae growing on the surface of the growing medium may be unsightly, but is usually harmless to the seedlings, unless it grows over small, slow-growing seedlings and smothers them. Because algae can bind the surface of the compost together, it can cause the surface to curl up if it dries out and up-root the seedlings. Total drying out of containers containing small seedlings should generally be avoided, but some exposure to the air following watering may be helpful to discourage growth of algae. While some of the advice given here may seem counter-intuitive for succulent plants from dry climates, it should be remembered that many seedlings initially develop in shaded cracks in rocks, or under the protective shade of a 'nurse' plant in their natural habitat.